The berlo’s model follows the smcr model this model is not specific to any particular communication. Source: The source is were the message originates. Attitudes – The attitude towards the audience, subject and towards one self for e.g. for the student the attitude is to learn more and for teachers wants to help teach. Knowledge– The knowledge about the subject one is going to communicate for e.g. whatever the teacher communicates in the class about the subject so having knowledge in what you are communicating. Note: It is not talking about the general knowledge it is all about the knowledge of the subject, so it is the familiarity of what you are communicating. Social system – The Social system includes the various aspects in society like values, beliefs, culture, religion and general understanding of society. It is were the communication takes place. For e.g. class room differs from country to country like behaviors, how we communicate etc. Note: We can communicate only to the extent that the social system allows, when we communicate take social system into account. Culture: Culture of the particular society also comes under social system. All to this model, only if you have the above in the proper or adequate proportion v can communicate. Encoder: The sender of the message (message originates) is referred as encoder, so the source is encoding the message here. Content – The beginning to the end of a message comprises its content for e.g. From beginning to end whatever the class teacher speaks in the class is the content of the message. Elements – It includes various things like language, gestures, body language etc, so these are all the elements of the particular message. Content is accompanied by some elements. Treatment – It refers to the packing of the message. The way in which the message is conveyed or the way in which the message is passed on or deliver it. Note: When it is too much treatment also the communication will not happen properly. Structure– The structure of the message how it is arranged, the way you structure the message into various parts. Note: Message is the same but if the structure is not properly arranged then the message will not get to the receiver. Code– The code of the message means how it is sent in what form it could be e.g. language, body language, gestures, music and even culture is a code. Through this you get/give the message or through which the communication takes place or being reached. Note: Only when the code is proper, the message will be clear, improper use may lead to misinterpretation. Whatever communication we do it is there either of these channels. Hearing: The use of ears to get the message for e.g. oral messages, interpersonal etc. Seeing: Visual channels for e.g. TV can be seen and the message is delivered. Touching: The sense of touch can be used as a channel to communicate for e.g. we touch and buy food, hugging etc. Smelling: Smell also can be a channel to communicate for e.g. perfumes, food, charred smell communicates something is burning, we can find out about which food is being cooked etc. Tasting : The tongue also can be used to decipher e.g. Food can be tasted and communication can happen. Note: Despite not mentioning a medium we need to assume that as communication is taking place channels can be any of the 5 senses or combination. Decoder : Who receives the message and decodes it is referred to as decoder. Receiver: The receiver needs to have all the thinks like the source. For e.g. Communication skills on source side is good then the receiver should equally have good listening skills. We cannot say the entire message passed doesn’t reaches the receiver has it is because the receiver may not good in listening, so only for the effective communication the source and the receiver to be in the same level. Note: Self image differs from person to person, for communicating the person should consider the receiver. Keep the receiver in mind, speak accordingly and give them what they need. Main drawback of the model is that the model omits the usage of sixth sense as a channel which is actually a gift to the human beings (thinking, understanding, analyzing etc). so funny! HE DID WELL BUT THERE IS A NEED OF IMPROVING THE WEACKNESSES. Thanks too much!!! This made me completely clear that for what purpose communication is designed for and what are those imperative factors that makes it effective ….. I did really enjoy the different modes of Berlo’s elements of communication. following the berlo communication model it is diffucult to use this communication model to teach the children at the context of having the same attitude with the sender also the sender from different culture can send the message to some one else and message are well recieved. he make me aware about communication in general,keep it up! berlo model is the best method of communication. berlo model is the best model of communication in the school and colleges. The model is good but not for teaching at all. I understood the message and can relate to the model but I do believe there is more responsibility on the decoder an his ability to comprehend the information and form being conveyed or communicated. Communication skills is a major component as listed in the model. All relies on the decoder or no message or response. Looking forward to reading the other links. Good but not for learning and teaching purposes! what are the applications of the model in life today? Actually the model itself is good for the sake of communication, but in teaching am little bit skepticl due to one of the elements in Source so called culture.Its not necessary a teacher to be of the same culture with a class regarding that teaching is a profession and the application of pedagogy a teacher can teach any group of people despite their culture. NOW I UNDERSTAND WHY WHEN I WAS CHILD MOST OF MY FRIENDS DOES NOT UNDERSTAND MY SPEECH. now I’m able to explain it.thanks! Thanks for this presentation. I didn’t know Berlo’s of communication had such information. It’s nice to understand that in order for me to communicate meaningfully I need to be at the same level with the message recipient. Thanks for finally writing about >BERLOS SMCR MODEL OF COMMUNICATION | Communication Theory <Loved it! 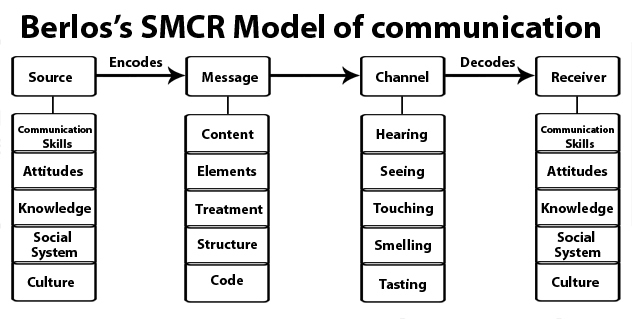 BERLO’S SMCR MODEL OF Communication is best for communicating with the same level community in same situation but there no feedback system. Without feedback, communication will not be completed. So it’s may be SMCRF. Thanks.